LOOKING like the type of guys you wouldn’t want to have moving in next door, 12 men dressed in black wearing quirky hats wandered on to the altar of Wesley Church. It didn’t look good, but then they started singing a rousing Georgian table song a capella and it was clear that these blokes knew what they were doing. It was a bit spooky and also intriguing. 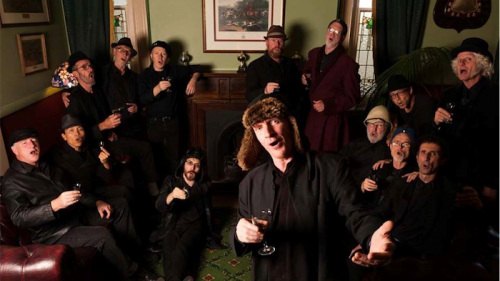 Formed in the Blue Mountains of NSW in 2001 by New Zealander, Stephen Taberner, the Spooky Men first attracted wide attention at the National Folk Festival in Canberra in 2004. They have since performed at festivals in the UK and Europe. Their popularity in Canberra was clear with every seat in the Wesley Church filled for their concert. The first half of the show consisted mostly of songs celebrating aspects of the Aussie male that were probably best left unsaid but they were sung in fine arrangements and with clear, confident harmonies, making them even funnier. Song titles included “We Are Men”, “My Favourite Body Part”, “We Are Not a Men’s Group” and the unforgettable “Don’t Stand Between a Man and His Tool”. Stephen Taberner, who conducted as well as sang, regaled the audience with deadpan commentary as the concert progressed. The audience reacted as if they had heard it all before and were waiting for him to say their favourite lines. As a first timer at one of their concerts, I felt it was getting a bit too indulgent at times and needed tightening up. The second half, while still offering enjoyable moments of great silliness, also included some unexpectedly tender songs such as “Fiddle and Drum” by Joni Mitchell, “Picture In a Frame” by Tom Waits and sung beautifully by group member, Warren, and “Crossing the Bar” from the poem by Alfred Lord Tennyson. This group has a great gimmick going for them but they are also superb musicians who deserve the success they have achieved.